Florian Sennlaub obtained his MD in Germany before receiving his PhD at the University René Descartes in Paris for his work on the role of iNOS in ocular neovascularization. He then went on to study the mediators of microvascular degeneration in Dr Sylvain Chemtob’s Laboratory in Montreal. 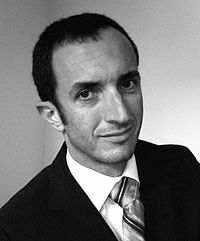 He currently directs his own research team at the French National Institut of Health Research (Inserm). His laboratory, at the Centre de Recherche de Cordeliers in the heart of Paris, focuses on the molecular mechanisms of age-related macular degeneration. His research is supported by grants from the French national research agency (ANR). Dr. Sennlaub is a recipient of the prestigious European Council Starting Grant. The succinate receptor GPR91 in neurons has a major role in retinal angiogenesis. Houssier M, Raoul W, Lavalette S, Keller N, Guillonneau X, Baragatti B, Jonet L, Jeanny JC , Behar-Cohen F, Coceani F, Scherman D, Lachapelle P, Ong H, Chemtob S, Sennlaub F.
CD36 Deficiency Leads to Choroidal Involution via COX-2 Downregulation. Trans-arachidonic acids generated during nitrative stress induce a thrombospondin-1-dependent microvascular degeneration.